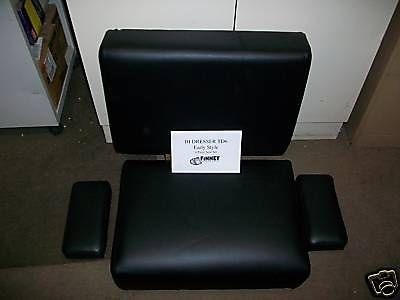 You are bidding on a new black back, seat, and arm rests set for the International Dresser TD6 Dozer. Note the sizes below and compare to your machine; this set is for the earlier machines and the T6 models We have a separate listing for later model TD6 machines. Check out my other items! This is a four piece set. Not only will you get top quality replacement cushions if you buy with us, you will also save $$$$$ compared to going to your local IH Dresser dealer and paying a couple of times more for the same items. These are not made by IH Dresser; however, in our business we use them all the time in machines that need new seats. They are excellent quality and a perfect fit. Sometimes it is fun to make the IH Dresser dealers look so greedy...we do it every day for our customers. 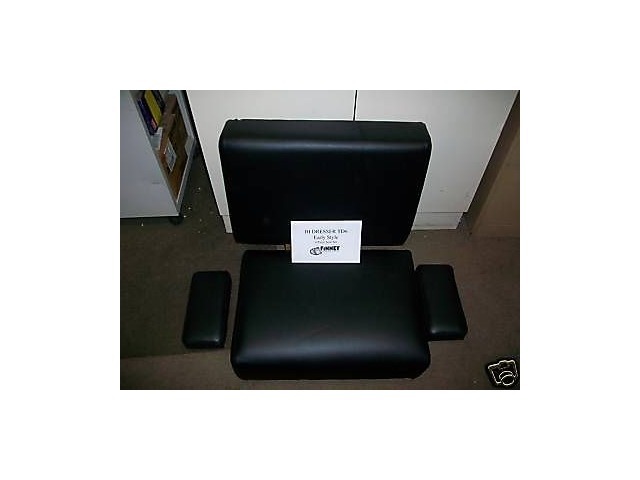 We will make available as seperate pieces upon request (if you only needed a single cushion, jus the arm rests, etc). BACK REST-- 22" wide/ across x 15" high/ tall. Bolt spacing on reverse side is 12"
This seat style mounts directly on the machine frame. If there are any mounting brackets, they should be taken off your old cushion and mounted onto these . Just take off your old cushions and replace with the New.